Find out key facts about plastic in the ocean with our infographics, as well discover their impact and how the EU is acting to reduce plastic litter in the seas. The results of today’s single-use, throw-away plastic culture can be seen on sea shores and in oceans everywhere. 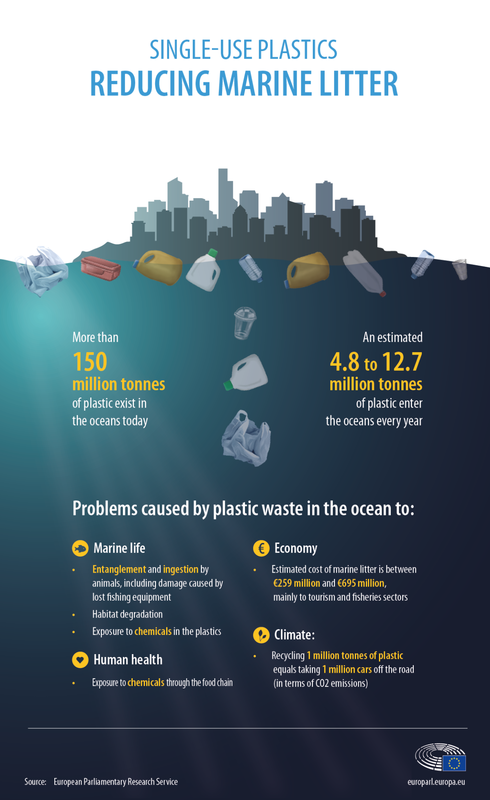 Plastic waste is increasingly polluting the oceans and according to one estimation, by 2050 the oceans could contain more plastic than fish by weight. 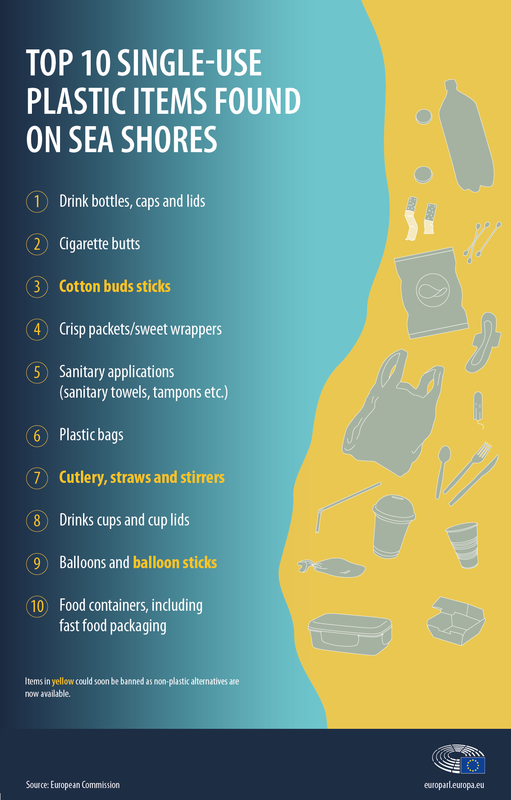 New EU rules, adopted by MEPs on 27 March 2019, tackle lost fishing gear and the 10 single-use plastic products most widely found on European shores. Together these two groups account for 70% of marine litter. Plastic doesn’t just make a mess on the shores, it also hurts marine animals who get entangled in larger pieces and mistake smaller pieces for food. Ingestion of plastic particles can prevent them from digesting normal food and might attract toxic chemical pollutants to their organisms. Humans eat plastic through the food chain. How this affects their health is unknown. 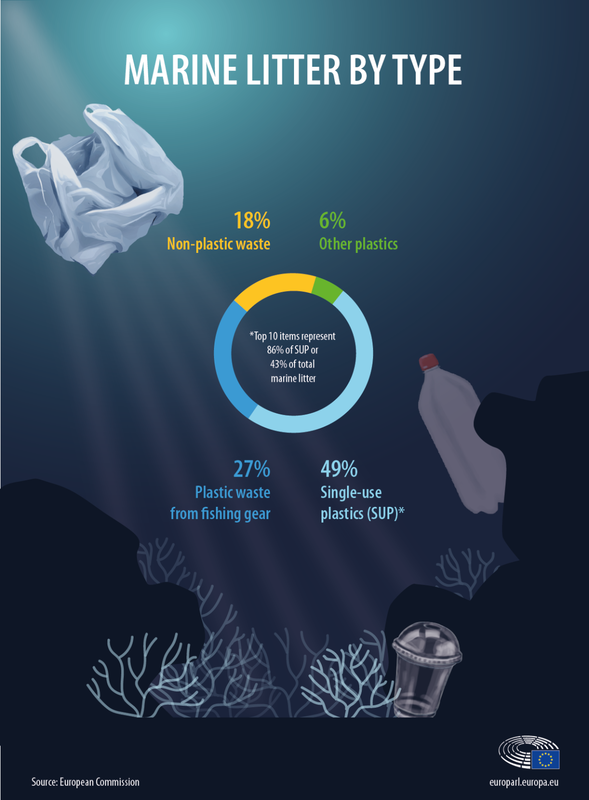 Sea litter causes economic losses for sectors and communities dependent on the sea but also for manufacturers: only about 5% of the value of plastic packaging stays in the economy – the rest is literally dumped, showing the need for a approach focussed more on recycling and reusing materials. 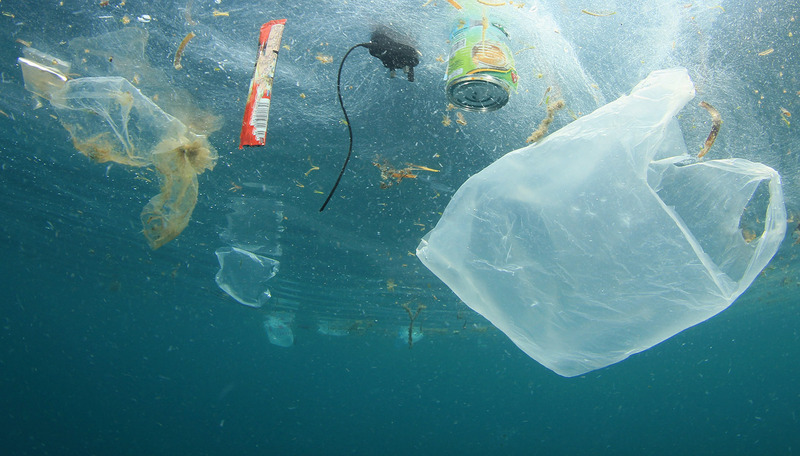 The most effective way to tackle the problem is to prevent more plastic getting in the ocean. Single-use plastic items are the biggest single group of waste found on sea shores: products such as plastic cutlery, drink bottles, cigarette butts or cotton buds make up almost half of all sea litter. A total ban is proposed for single-use plastic items for which alternatives in other materials are already readily available: cotton buds, cutlery, plates, straws, drink stirrers and balloon sticks. MEPs also added oxo-degradable plastic products and fast food containers made out of polystyrene to the list . Extended producer responsibility, especially for tobacco companies, in order to strengthen the application of the polluter pays principle. This new regime will also apply to fishing gear, to ensure that manufacturers, and not fishermen, bear the costs of collecting nets lost at sea. For fishing gear, which accounts for 27% of sea litter, producers would need to cover the costs of waste management from port reception facilities. EU countries should also collect at least 50% of lost fishing gear per year and recycle 15% of it by 2025. Single-use plastic items such as plates, cutlery, straws, balloon sticks or cotton buds, will be banned in the EU under plans adopted on Wednesday.